Profit with Trade Up Contracts in CS:GO! We show you how to use the CS:GO Trade Up Contract correctly! We've the best tool and very important information for you! Hello, my name is Lars and I want to show you how you use the Trade Up Contract in a profitable way. First of all, you need to know how the Trade Up Contract exactly works. In general, this isn't as complicated as you might think. Basically, the Trade Up Contract is a tool in Counter-Strike: Global Offensive that requires 10 skins of the same rarity. If you want to know how to make profit using it, just follow the guide. In general, I recommend you to follow the guide to the end. I provide you information that you can help you to get advanced when it comes to the CSGO Trade Up Contract. In case you have problems with a term, feel free to check out the FAQ. If you're new to Trade Up Contracts you can stay - otherwise, you should go on to the NEXT STEP. You need 10 skins of the same rarity. You put these into the "Trade Up Contract" that you can find in your inventory in CSGO. In the next step, you just a to sign the Trade Up Contract. It doesn't mean that's a real contract, you just have to make a stroke. In exchange for the other items, you'll get a reward. This reward is exactly one grade higher than the skins you have put in. In the next step, I show you how to use our tool efficiently. Generally, my tool gives you free access to an algorithm that calculates (24/7) the best trade ups. The first box is the input that you have to buy when you want to do this trade up. The color of this box represents the rarity of the input. Additionally, there are information about skin, collection, prices and a direct link to OPSKINS and Steam. Remember: You'll get a reward that is one grade higher than the input. In the next boxes, you can see the possible rewards if you do this trade up with its skin, condition, price, profit/loss and chance. In this case, you can get three skin with a chance of 33.33% each. Boxes with a green background let you make profit while boxes with a red background mean loss. With "Next" and "Previous" you have the option to look at other possible trade ups. Notice please that the algorithm tries to provide you the best trade ups first. Example: When you put 10x "FAMAS | Sergeant" into the Trade Up Contract, you receive an "AK-47 | Redline", a "Nova | Antique" or a "P90 | Trigon" with 33.33% each. When you get the AK-47, you make profit - otherwise, you would do loss. Now I explain you something more difficult. But after reading this, you'll be able to recheck trade ups to get sure that it works. Firstly, I'll explain what a "Float Value" is and what it has to do with the Trade Up Contract. There is something deeper than the normal conditions like "Field-Tested", "Battle-Scarred" and co. It just represents a value called "Float Value". The float value in CSGO has a range from 0.00(minFloat) which is the best you can get and 1.00(maxFloat) which is the worst one. Example: If a skin's float value is 0.27 its condition is "Field-Tested." If a skin's float value is 0.05 its condition is "Factory New." The problem is that some skins have a special range - for example "AK-47 | Redline" which has a range from 0.10 to 0.70. This means you can't get an "AK-47 | Redline" that is Factory New because it's not possible to get this skin with a float value lower than 0.10 which means Minimal Wear. On the other hand, you can't expect to get this skin with a float value higher than 0.70 - even if it's possible to get this skin in Battle-Scarred. Regarding this formula, sometimes it can happen that you get appreciated reward but with a worse condition than expected. This is because your reward has a high minFloat. If you want to know the required average, you can use THIS WEBSITE. In conclusion, you should recheck every trade up on the range of float values because otherwise, you may get a worse condition than you expected. To get the minFloat & maxFloat of an item you can use THIS WEBSITE. "Field-Tested" and "Battle-Scarred" trade ups usually are safer because they have a larger float value range representing its condition. Don't be afraid. Our algorithm considers this problem so I show you only trade ups where the rewards have a low minFloat. 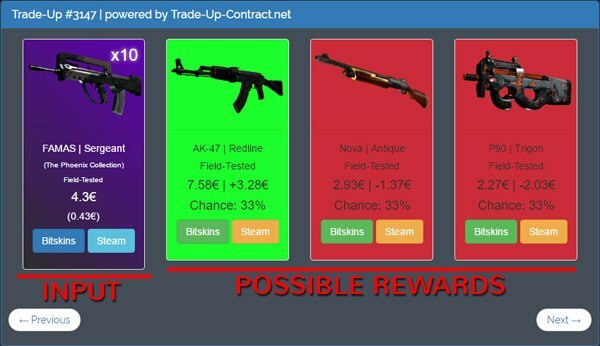 We've developed a great tool that you can use to find the best possible trade ups in CS:GO. Prices & other factors are always up-to-date so you will always get high-quality results. We offer you the best tool and very important information - FOR FREE! Our website is very useful. Use them to make profit using the Trade Up Contract in CS:GO! The best thing is that our services are completely free. You don't have to pay anything for it. The Trade Up Contract is a tool in CS:GO that player can use to upgrade ten (10) of their weapons to one (1) item with a higher rarity. You inform yourself about the Trade Up Contract and how it works. You use our tool and choose your preferred trade up. You buy necessary skins (input) from BITSKINS or Steam. You put all skins in the Trade Up Contract in CS:GO. When you submit, you'll get your reward. We aren't responsible for your bad luck & the correctness of the presented trade ups. BITSKINS is a great marketplace for CS:GO skins. You can use this marketplace to buy skins cheaper and to prevent the 7 day trade restriction by Steam. There are two reasons why we redirect to BITSKINS: On the one hand, we'll get a fair provision by them, on the other hand, they are the cheapest and the best marketplace for CS:GO skins.